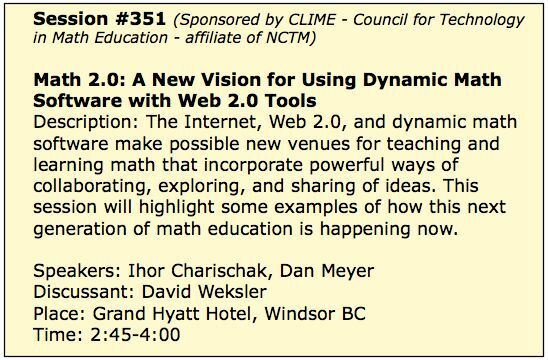 If you are attending the NCSM conference in San Diego on April 21, you can learn more about the new exciting world of Math 2.0 during the Special Interest Session on Wednesday afternoon 2:45-4:00. 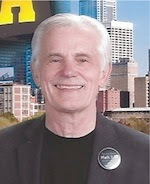 One of the presenters will be Dan Meyer of Dy/Dan fame. 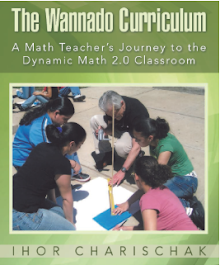 An archive of the event will be available online and at Booth #230 in the exhibit hall during the NCTM conference. • Ihor will bring you up-to-date on Math 2.0 - a grass roots effort to "reform" math teaching & learning from the "inside out". 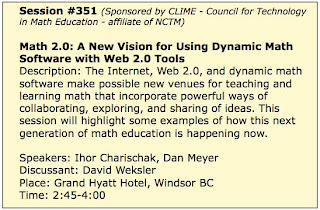 Also, he will describe the event that will be happening in Booth 230 during the NCTM meeting. Then he will introduce Dan Meyer. • Dan (dy/dan) will be sharing his experience of being a pioneer Math 2.0 kind of teacher who uses current technologies to help him redesign the math curriculum so it encourages and improves students ability to problem solve. Also, he will share a framework with examples for his reinvented curriculum that will help his "impatient problem solvers" become more patient and rigorous in their approach to solving problems. • Discussion and Q/A will follow. 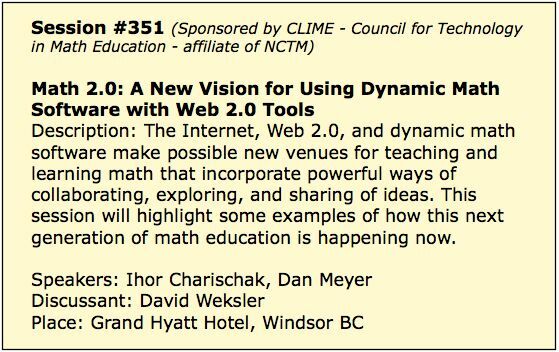 See list of all tech related sessions at NCTM and NCSM sessions in San Diego next week.